Krista Tippett, host: Béla Fleck is one of the greatest living banjo players in the world. He’s followed what many experience as this quintessential American roots instrument back to its roots in Africa, and he’s taken it where no banjo has gone before. 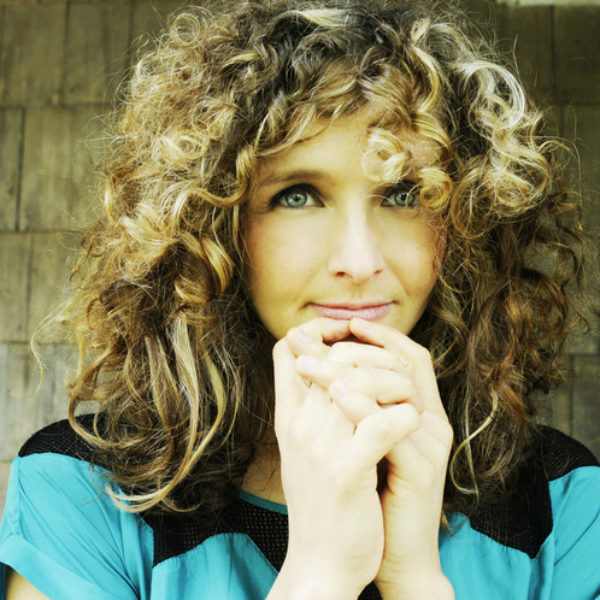 Abigail Washburn is a celebrated banjo player and singer, both in English and Chinese. These two are partners in music and in life — recovering something ancient and deeply American all at once, bringing both beauty and meaning to what they play and how they live. 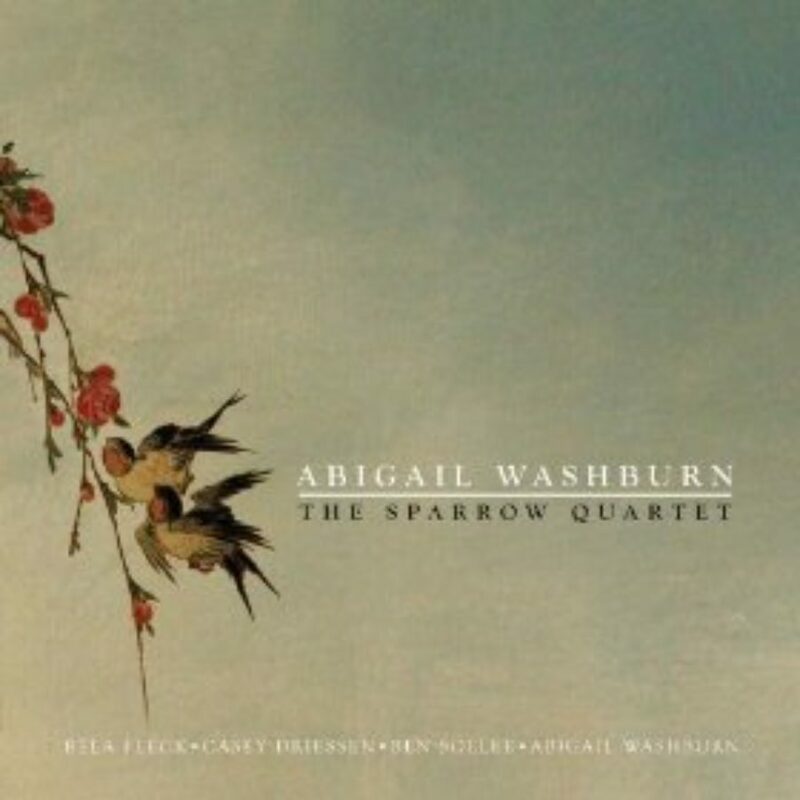 Abigail Washburn: When I heard Doc Watson, I felt like I heard the beauty of authentic American culture. I wanted it so badly; I’d been looking for it so badly. And I finally heard it when I heard Doc: this high, lonesome, searching, struggling, suffering, hopeful voice singing this ancient melody and these old, old words. 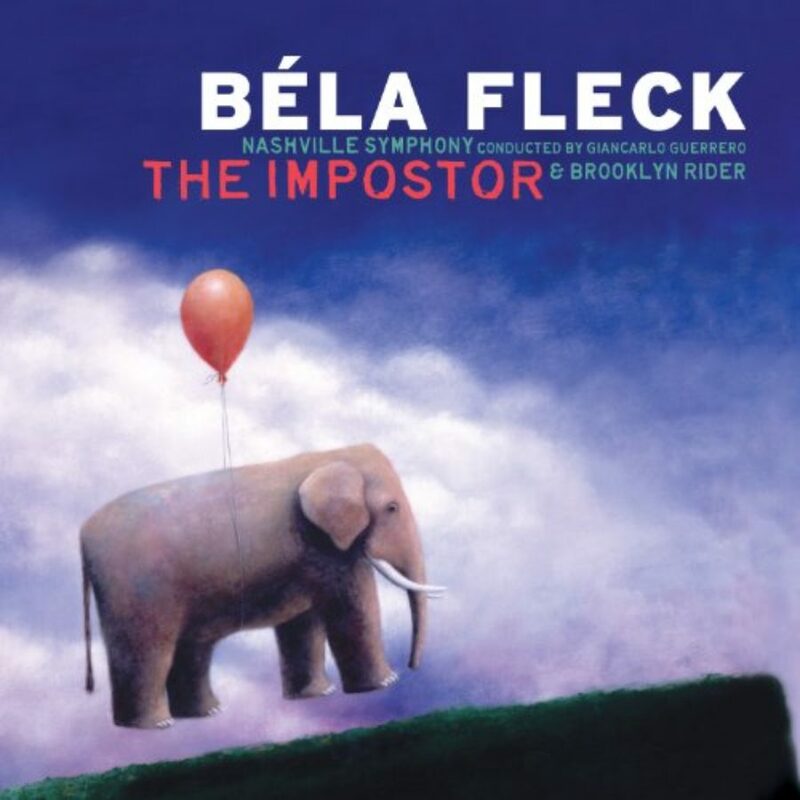 Béla Fleck: For me, what I think the word I thought of when you were talking about that — what you actually heard was the truth. It just sounds so true, even though it’s just notes. There’s something more about it. 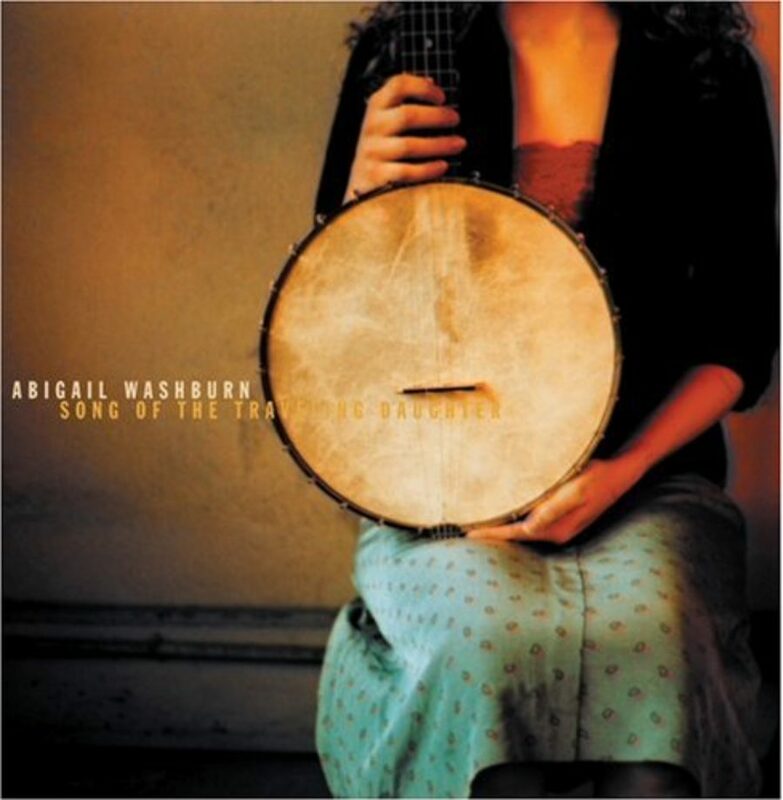 When Abigail Washburn graduated from college in 1999, she was poised to work for world peace after studying law in Beijing, but she was captured by the banjo instead. Béla Fleck became well known with his group Béla Fleck and the Flecktones. I spoke with them in 2015, when Nashville Public Radio brought us together at the Belcourt Theatre in their hometown. Ms. Tippett: Abigail, I know that you have a habit of bursting out into song spontaneously, and I want to encourage you to do that tonight. Ms. Tippett: You can dance, anything that — or if you want to grab your banjo. OK. [laughs] Where I always start my conversation, whether I’m talking to a physicist or a banjo player, is, I’d like to hear a little bit about whether there was a religious or spiritual background to your childhood. Abigail, I’d like to start with you. You grew up in a few places: Chicago, Washington, Minnesota a little bit. Ms. Washburn: I forgot that you were going to study me. Ms. Washburn: Oh, my. Yeah, well, my grandmother, who was in Evanston, Illinois most of her life, raised my mother there a Unitarian Universalist. I was raised from 3 to 11 years old in Montgomery Village, Maryland. And the religious education in that UU Church — we actually went to everybody else’s church. [laughs] We learned about what it was like to go to temple or synagogue or mosque, all kinds of different churches. I was the kid in high school that, instead of having band posters on my wall, I had Martin Luther King Jr. and Gandhi and the United Nations mural. And instead of going to my senior prom, I decided to go to the United Nations Youth Disarmament Conference in Canada. I ended up coming back in time for prom because a cute guy asked me. But I actually did think that was more important, to go the U.N. Youth Disarmament Conference. So that was my childhood, as much as I should probably say. By the time I was leaving high school and going off for all the different adventures, the next chapter, I would say that I believed that my faith and my spiritual path was about cultivating myself for good action. Ms. Tippett: Béla, how would you think about the religious or spiritual background of your childhood, however you think about that now? You grew up in New York. Mr. Fleck: Yeah, I was raised a harmless heathen. My mother’s family is Jewish. My father’s family wasn’t. But they were split up when I was a kid. And actually, I didn’t meet him until I was in my 40s, when I searched him out, which is another story. I know I didn’t feel like I had any kind of religious or spiritual thing going on as I grew up. And I think I was looking for something when the banjo turned up and took the place of a lot of that for me. It became my most important thing. And a lot of the things in religion you can find in music too, so I’m hoping that that’s going to work out for me. If there’s a hereafter. Ms. Washburn: I think it’s done fine. Ms. Tippett: Just as long as you have your banjo with you. I sense that your mother must have communed musically, if not spiritually, with music also. This is so fascinating: She named you after not one, but three Central European composers. Mr. Fleck: Yeah, actually, that was my father, whom I didn’t know. And believe me, I got the better names than my older brother. I won’t go into that right now. 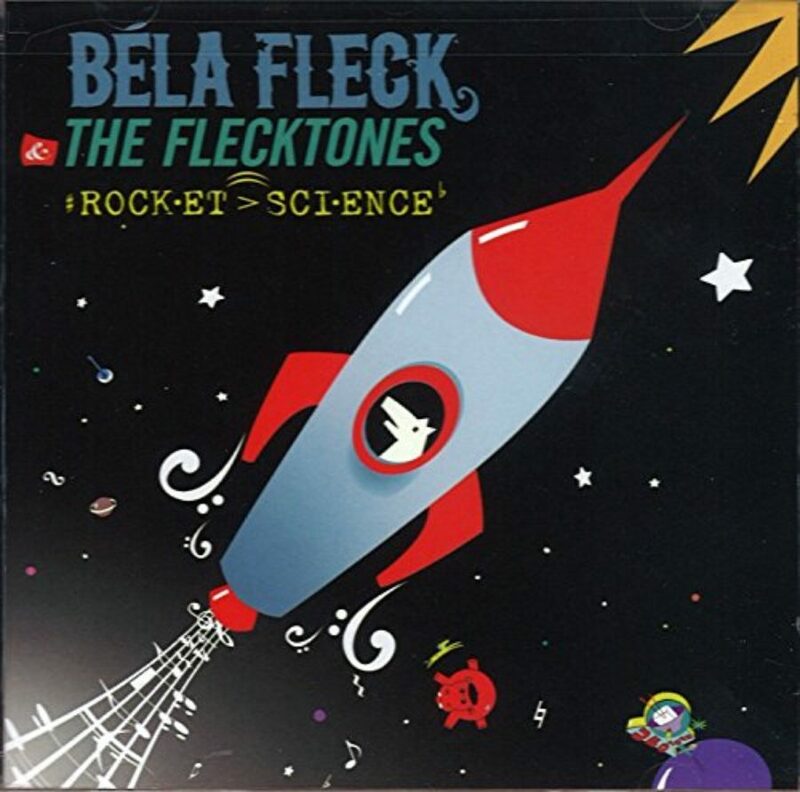 Mr. Fleck: Béla Anton Leoš Fleck. Ms. Tippett: And who’s the third? Mr. Fleck: Anton Webern. So some pretty out-there stuff. Ms. Tippett: But not banjo music. I mean, out there in a different way. Mr. Fleck: Well, it could be. Ms. Tippett: Well, it could be. You’ve done — yeah, you’ve done that. And you discovered the banjo — you were captivated by Earl Scruggs. Mr. Fleck: Yeah, Earl Scruggs of “The Beverly Hillbillies” theme, which actually — people talk about a “come to God” moment, and for most banjo players of note in the bluegrass world, hearing Earl Scruggs is that moment. There’s before and after. Ms. Tippett: Tell us about that. What is that? What is it that happens in that moment? Mr. Fleck: I remember it was like lights going off. Every note was like a light going off in my brain. It was just an amazing sound. Now I try to explain it as being a high-tech yet primitive sound. Like, a computer can play fast, but you don’t get excited, you know? But there’s something so earthy and deep, especially about the way Earl Scruggs played, which turned people into believers. Ms. Tippett: You said something about real — I mean, you said this before: that people talk about the banjo as though it’s not a real instrument, which then I guess gets at the question of how we define “real,” right? First of all, I think it’s fascinating that neither one of you — you both, actually, came from the North. Neither one of you grew up surrounded by banjo and bluegrass. Talk about that, about the reality. What is real about this music that captured you, that just takes you away? Ms. Washburn: Well, my “come to God” moment in the folk music world was hearing an LP of Doc Watson singing and playing “Shady Grove.” Is this where you want me to bust into song? Ms. Tippett: Yeah, I do. [laughs] I was hoping you’d ask. When I heard that sound and Doc singing it, for me, there was this moment where I just knew I was hearing — and I should preface this, that I was really immersed in China at this point and loving Chinese culture and studying the language really intensely and been there a number of times. And when I heard Doc Watson, I felt like I heard the beauty of authentic American culture. I wanted it so badly. I’d been looking for it so badly. And I finally heard it when I heard Doc: this high, lonesome, searching, struggling, suffering, hopeful voice singing this ancient, ancient melody and these old, old words. It didn’t matter who owned it or where it came from, but this man was sharing it with me. And I knew that I had to go get a banjo and I had to learn “Shady Grove.” And instead of doing karaoke in China with my clients when I would become a lawyer someday, I would play ballads from Appalachia, of course. Mr. Fleck: Can I throw something in? For me, the word I thought of when you were talking about that — what you actually heard was the truth, something that was the truth. And I think that the greatest musicians that — when I think about even B.B. King, whom we just lost, about Earl Scruggs, and even Miles Davis, some of these people that played something that somehow seemed so profound. And these were just instrumentalists. Abby’s talking about Doc Watson, who could use words — it just sounds so true, even though it’s just notes. There’s something more about it. Ms. Tippett: This notion of roots, like roots music — which, again, it’s language we throw around. But when you start talking about what the music conveys and where it comes from, you realize how deep that is and what it touches in us. Ms. Washburn: Something that I learned from a movie that Béla made — and this isn’t a plug; this is just the truth. I watched Béla’s documentary Throw Down Your Heart. You called me on your big global phone from over in Africa a number of times, and I think it was when you were in Tanzania. He was learning the story of how, on that side, the journey of the banjo to America happened. Ms. Tippett: You were tracing the original roots of the banjo in Africa. Ms. Washburn: Yeah. What he had learned — and part of the reason the documentary is called “Throw Down Your Heart” is because, as people were being boarded onto the slave ships, they said, “Throw your heart down here. You’re not going to want to carry it to where you’re going.” And a lot of the slave masters figured out that if they had a banjo player onboard playing the music of home, more of the cargo would live to the other side. So the origins of the banjo in America are the bitterest of roots. It makes me want to cry just thinking about it in this moment. And it formed an amazing origin to what became a blend of traditions from Africa, Ireland, and Scotland, when those banjo players from Africa and those fiddlers from Scotland and Ireland started playing plantation dances together. That’s what really started what we know of as that early Appalachian and that early American sound. That sound is based in this bitter root, but with this actual hope — this hope that I can live — that I can live; I can survive. It’s an amazing tradition. Ms. Tippett: I’m Krista Tippett, and this is On Being. Today, in conversation with banjo icons Béla Fleck and Abigail Washburn at the Belcourt Theatre in Nashville, Tennessee. Ms. Tippett: To this idea of the reality and the truth in this music, there’s a story you told. The first track on your new album, which is your first album together, is “I’ve Been Working on the Railroad,” which you sing in a minor key. I love this story that you told about how — maybe this isn’t true either. Correct me if I heard this on the internet. Mr. Fleck: Well, our publicist writes a lot of these stories. Ms. Tippett: So yeah, maybe. Béla, you were traveling, and Abigail, you were home with Juno, and Juno was banging on the table? Ms. Washburn: Yeah, I was so proud of him. Ms. Tippett: You got really excited about that, which — this is a life lesson for other parents who are not musicians, because you thought, he’s learning rhythms, banging on the table. Ms. Washburn: Yes, I was so excited. Mr. Fleck: Because he was banging in time. It was consistent. Ms. Washburn: [laughs] That’s a fair question. Ms. Tippett: But then what I remembered is somebody — when I was learning to cross-country ski in Minnesota, somebody taught me how to keep my pace by singing “I’ve Been Working on the Railroad.” And I think — here’s the thing — I think a lot of people might think, “Oh, bluegrass music or folk music is not my music, is not my taste.” And yet so much of this music is woven into our lives in ways that we don’t even reflect on. Mr. Fleck: I don’t think — well, let me put it this way. Some bluegrass music might not be your taste, but some other bluegrass music might be. And if you just let the name “bluegrass” repel you because you just heard some bluegrass you didn’t like, you’ll miss out on a bunch of great music. And I think, whenever we decide we don’t like a kind of music, we’re the one that loses because there’s always something in every field that’s beautiful, that you would like. Ms. Tippett: Yeah. I’d like to circle back to China. You two have also — you’ve gone to China as well, right? I know you were back there. Mr. Fleck: Yeah, I’ve been there three times. One time we got to go to Tibet together, and it was apparently one of the first American and Chinese sponsored trips over there, which was a pretty incredible experience for all of us. 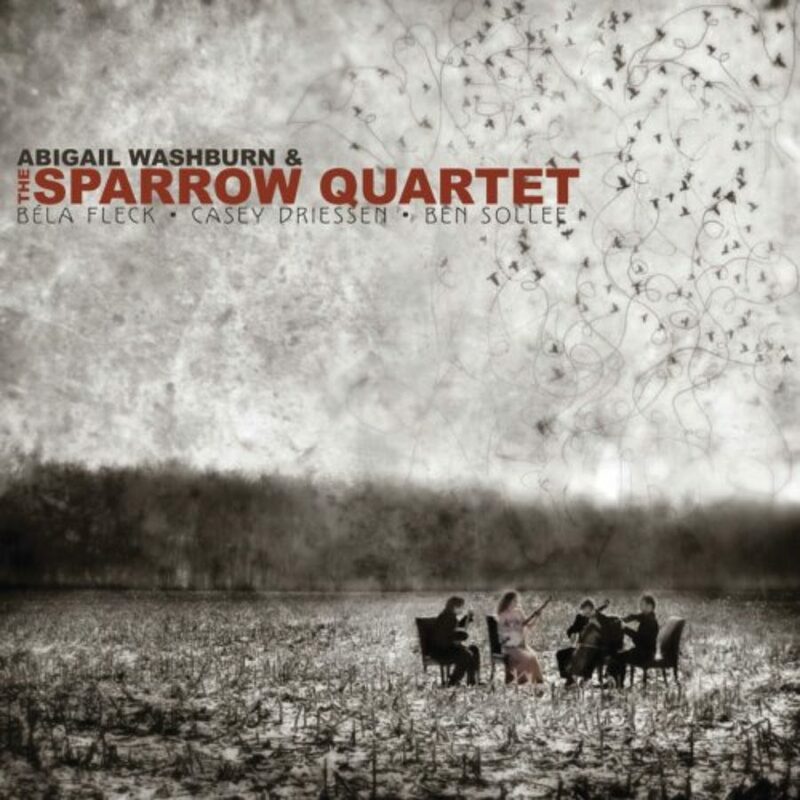 We were with the Sparrow Quartet at that time, with Casey Driessen and Ben Sollee, and we had a pretty incredible experience over there. Ms. Tippett: Have you also been over there, not just taking this music, but also collecting their music and doing some…? Mr. Fleck: Well, you did your Silk Road Trip. Mr. Fleck: Snakeskin covered banjo, really, but it’s a violin. Ms. Washburn: Snakeskin covered. Yeah. Tiny, tiny head, and it sits on your knee, and you play it. Mr. Fleck: It sounds like a human voice almost. Ms. Washburn: It sounds like a human voice to some and a dying cat to others. It really depends. He showed up, and he saw me in this wonderful band of musicians that I was there with from America. And he just didn’t look happy at all. He looked at me; he said, [speaks Chinese] — “Americans and Chinese simply cannot play music together.” It’s too different. And I looked at him and I was like, “Oh, OK. Well, would you just play for us then?” [speaks Chinese]. He pulled out his erhu, and he started playing this breathtakingly gorgeous melody from Tibet. And the band, as we were listening, we just started to tune up our instruments to match his tuning, and we just started playing along with him. And you could see this — it was barely there, but you could see just that corner of his mouth kind of turn up ever so slightly. Ms. Tippett: This is Abigail Washburn and her band jamming with a group of Uyghur musicians around the dinner table in western China as part of that Silk Road Tour. 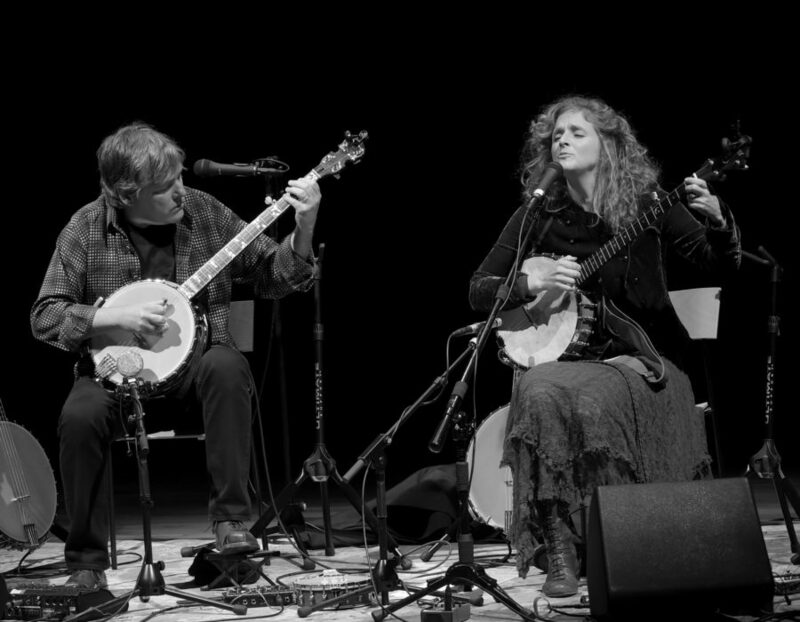 After a short break, more with Abigail Washburn and Béla Fleck. You can always listen again and hear the unedited version of every show we do on the On Being podcast feed. Now with bite-sized extras, wherever podcasts are found. I’m Krista Tippett, and this is On Being. Today, with Béla Fleck and Abigail Washburn. He is one of the greatest living banjo players. She is a celebrated clawhammer banjo player and singer, a passionate explorer of the folk traditions of both America and China. And they are partners in music and in life — recovering something ancient and deeply American all at once, bringing both beauty and meaning to what they play and how they live. Nashville Public Radio brought us together in their hometown, in front of a live audience at the Belcourt Theatre. Ms. Tippett: Béla, you have said the first time you heard Abigail’s music, you were listening in the car, and you got stopped for speeding. Mr. Fleck: Yeah, it was out in Franklin. There was a party. Ms. Washburn: That’s so romantic. But then she gave me this CD at this party, and I started listening to it. And I had a completely different experience because the banjo was up front. There was this groove to it. She was singing like you just heard her, with this ancient sound, very connected to traditional music. And I just started driving faster and faster and going, “Wow, I really like this.” I think I was even talking to myself. And then I got pulled over and had to walk the line. Mr. Fleck: Wait, could you do that, Abby? Ms. Washburn: I can’t remember it. How does it go? Ms. Tippett: Yeah, although, I’m more of a Next Generation fan. And there are clearly people in the audience who know what we’re talking about. I have to say, the titles of the Flecktones albums are really intriguing: Flight of the Cosmic Hippo. Ms. Tippett: Which one was that? 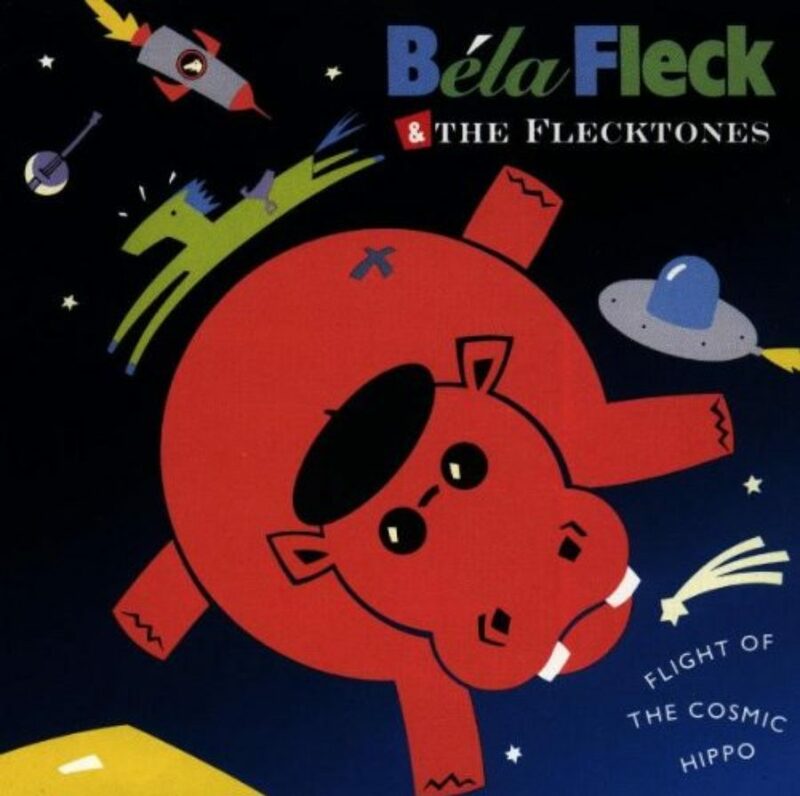 Mr. Fleck: Flight of the Cosmic Hippo. Ms. Tippett: Flight of the Cosmic Hippo? So it didn’t have a hippo on the cover? Mr. Fleck: It had a hippo on the cover. Ms. Tippett: It did have a hippo on it. I see. OK. And then there’s UFO Tofu. Ms. Tippett: Oh, I see. Yeah, it does. Mr. Fleck: We had a musical piece that was a palindrome that was about five minutes long that all went forward and went backwards. It had about six different palindromes buried within it. So we used to tell stories about palindromes before we’d do that song. And that one popped up. A guy named Baby Gramps told us about that one and — yeah. Ms. Tippett: That’s great. And then, Three Flew Over the Cuckoo’s Nest. Mr. Fleck: Yeah, we were searching hard at that point. 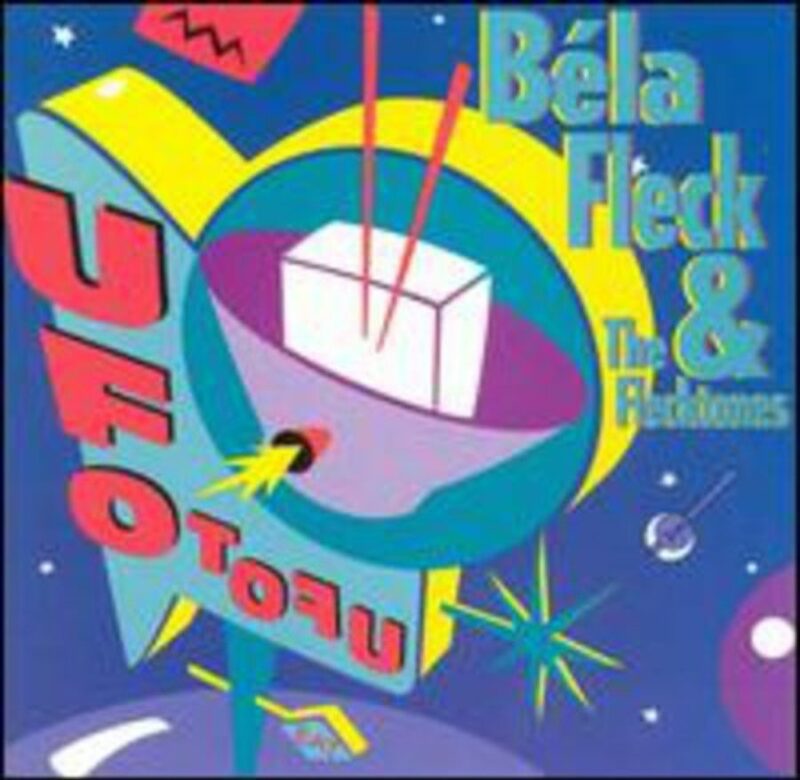 Ms. Tippett: Yeah, you’ve got to — you really hit the peak with UFO Tofu palindromes. We did an event in New York City, in the fall, about Bach — it was during the Bach month — with a computer scientist and a Bach lover. We actually put this recording, this amazing recording of you playing Bach’s “Partita for Violin No. 3” on the banjo on our website. It was so gorgeous. Mr. Fleck: You have incredible taste. Ms. Tippett: Thank you. [laughs] But I was then also really amazed to learn that you’ve written a concerto for banjo, and you did it with the Nashville Symphony Orchestra, with an 80-piece symphony orchestra. Very intrigued by the title, “The Impostor,” that you gave to that. Would you talk about that? Mr. Fleck: Sure. And really, The Impostor — Abby and I have talked about feeling like you’re the outsider, you’re the other, you know? Ms. Tippett: It comes back to this idea that the banjo’s not a real instrument. Mr. Fleck: Yeah, and especially — and I realized at some point that — not always, but often putting myself in positions where the banjo hasn’t been played before. So I have to figure out a role for the banjo with Indian musicians or with Chinese musicians or with classical musicians or with jazz musicians. The only place I really know exactly what the banjo is supposed to do is bluegrass. That’s the place where I know exactly what almost every banjo player of note has played since Earl Scruggs till now. I know how they would do things, and I can make my choices based on an understanding. But everywhere else, I’m waiting for somebody to say, “Hey, you’re not supposed to be in here. Get out of here.” So that’s a feeling that I sometimes get when I’m feeling insecure, like somebody’s going to catch me and kick me out. So with The Impostor, playing in front of a symphony orchestra and writing the piece and everything too, I had my ears peeled for somebody to eject me. Ms. Tippett: And then there’s this place at the very end where the banjo breaks free from the rest of the orchestra. What did that symbolize to you? Mr. Fleck: In writing the piece, I was making a serious attempt not to do an Appalachian Concerto. But by the end of the piece, I was really — I had been trying hard to complete this piece, and I wasn’t coming up with a big ending. That’s when, desperately, I reached for Earl Scruggs, and he was there for me. And not only that, I dedicated the piece to Earl Scruggs and got to play it for him before the premier. He came to the premier, and it was the last concert that he came to. Mr. Fleck: Yeah, and he passed away maybe five or six months later. So it was a — some closure there. He was very sweet. Ms. Tippett: It felt to me like you really have come full circle. Isn’t there a song in your album you’ve done together from Béla Bartók? Ms. Tippett: Yeah? So you’ve actually come back to your namesake. Ms. Tippett: And you had met your father at that point? Mr. Fleck: Yeah. A lot of the Darth Vader-ism had subsided by making him into a real person. And then I was ready to go face Bartók, which turned out to be some of the greatest music I ever heard. Mr. Fleck: Oh, my God. It’s so different. It’s so free from convention and imaginative. I love it. I really do. So, yeah, I found a couple of piano pieces and arranged them for Abby and I to play on the new album. That was the first Bartók that I’ve done. But I’d like to actually try to learn a violin concerto on the banjo and things like that. That’d be a lot of fun. Ms. Tippett: I’ve seen you both talk about the music you do together in terms of dialogue and conversation. Mr. Fleck: Well, that’s Abby. I am not a talker. This is a lot for me. Ms. Tippett: OK, you’re doing really well. Mr. Fleck: Thank you, thank you. 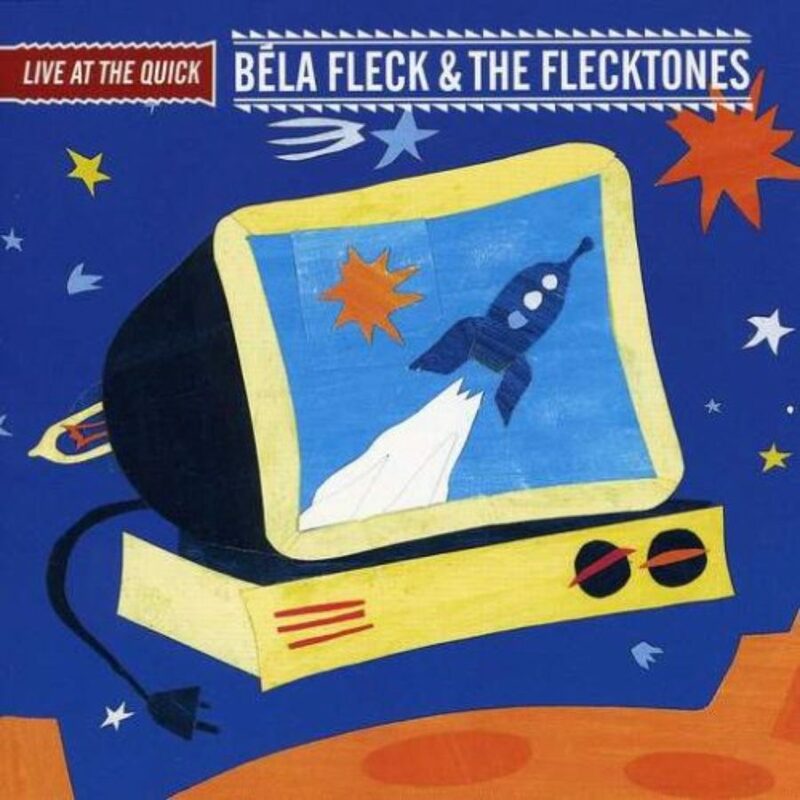 Mr. Fleck: But if you came to a Flecktones show, maybe there would be speaking two or three times in the whole night, and it would be brief. But Abby is a great storyteller, and she reaches out to the audience and really gets to know them and talks a lot. So I’ve had to learn to come to terms with that and participate in that as well. Mr. Fleck: Because we only had time for like five songs in a two-hour set. I was trying to get this song to time ratio up a little bit. Ms. Tippett: OK. All right. I didn’t necessarily — so there is the literal conversation. But there’s also the kind of dialogue between the banjo and the voice and also the dialogue between — when you’re both playing the banjo, different kinds of banjo and different styles and — right? Ms. Washburn: Oh, on stage, like as a part of our performance? Ms. Washburn: Yes, I think a real intention when we were finally taking our thing together seriously — not just our love for one another but our ability to perform together, which really hit when we realized we’re going to have a baby. So we decided that we needed to really make an effort to put out something in the world that was like a formal offering, musically, as a duo. Ms. Washburn: Just hit the road. Mr. Fleck: …and take the baby with us. And that’s what we’ve been doing for the last couple of years. Ms. Washburn: Yeah, and so when we were planning our record, we thought, “We know that two banjos and a vocal can be a really wonderful thing, but we actually do have to prove it.” So we decided to create soundscapes that differed from track to track and that differed from song to song, which meant including different types of banjos. Back in the late 1800s, there were actual banjo orchestras all over America, and they were really popular. There were big, double-banjo basses, with end pens that people stood and played, and they looked like taiko drums with strings on them, and piccolo banjos and banjo-ukes and banjolins — and it goes on — banjo-cellos. Ms. Tippett: Why did that go away? Ms. Tippett: Yeah. Why do we not even know this? Mr. Fleck: It’s great. We’re constantly amazed by our situation. Ms. Washburn: Yeah, it’s a sweet, sweet situation. Probably the hardest thing to do is to find time to make new music, because we wake up in the morning with Juno on the bus, and the first thing we want to do is just go play with him and be with him, and so we do that. We spend several hours together with Juno until he falls asleep for his nap. Mr. Fleck: And then we’re wiped out. Ms. Washburn: And then we’re tired. Ms. Tippett: I’m Krista Tippett, and this is On Being. Today, with musicians Béla Fleck and Abigail Washburn in a public conversation at the Belcourt Theatre in Nashville, Tennessee. Ms. Tippett: Oh, this is fun. Something also that intrigued me — actually, neither one of you has a really extensive professional training, right? You really came to this very late. But Béla, you are the premier banjo player, possibly, in the world. And Abigail, I have to say, when I first experienced the two of you, I also assumed that you were somebody who’d grown up learning this. You play with Béla Fleck, and the two of you are this banjo-playing duo. And when you were pregnant, some music reporter said, “And now they will give birth to the holy banjo emperor.” Right? But part of what you’ve been out there talking about — and you delivered the commencement address for Colorado College, for your alma mater. You talked a lot about this way you were open to experience, and you really discovered this thing that has become defining. And in fact, you’re helping to define this kind of music now and the culture. But it was very unexpected. You didn’t prepare for it all your life and in a linear way. Ms. Washburn: A piece of my story that I don’t really ever tell because it just adds another 30 seconds is — the fact that when I left Vermont on my road trip to go south, before I was headed to China to become a lawyer, my very first stop was at the Barre Center for Buddhist Studies, and I spent five days meditating. It was the first time I ever meditated in my whole life, and to this day, it’s one of the hardest things I’ve ever done, to sit still. My body ached. I became afraid I was hurting myself. I went into the darkest place. And one day, I remember I was sitting there. It must have been three days in or something, and I went into this very deep place. Finally, I wasn’t really thinking a whole lot, and I came out of it hours later, and my entire shirt was covered with tears and boogers. I mean, it was not pretty. In that moment, I stood up, and nobody was in the room. They had all left. And I know that I had let go of something major. I’m not even totally sure what it is to this day. But I know that I didn’t really feel like a victim anymore when I left that place. I felt like I was clean and fresh and pure, and I could make my decisions. And that, within days, I was in Louisville, Kentucky, playing the four songs I knew on the banjo and was offered a record deal in Nashville, Tennessee. I came to Nashville instead of going to China to go to law school. And I felt ready for that. I felt ready. That’s all I can say. Ms. Washburn: Yeah, I always loved singing. I was in choir all through school, and I’d always try out for the solos, and I never got them. So I really didn’t fancy myself much of a singer. I didn’t think I was going to be perceived as a good singer. Ms. Tippett: See, that’s what I got out of getting ready to talk to you. You don’t really consider yourself to be a great musician. Ms. Tippett: You feel like this is something you came to late — this imposter language. I don’t think you do feel like an imposter because you throw yourself into it so joyfully. But you don’t think of yourself the way other people think of you as a musician. Ms. Tippett: Because a song becomes a container for it? Ms. Washburn: It’s a container for the empathy and for the sensitivity. So I can feel something so strongly. Like, I’ve been singing the song “Come All You Coal Miners” that was written by an amazing woman named Sarah Ogan Gunning. She was raised in a coal camp. Her child starved to death because they couldn’t get milk for her baby, and her husband died of black lung, and all of these things. I hear her story, and I’m crying, and I’m crying, and I start to sing this song. Mr. Fleck: By a who? Mr. Fleck: I might have posted this. Ms. Tippett: You might have. Do you ever think of yourself as a teacher? Mr. Fleck: I don’t know. I know there are people that learn from what I do. And it’s exciting to see people that have taken what I do and built on it, just the way I’ve built on Earl Scruggs and Tony Trischka and so many great people that I learned from. But go to India, you might have a very different experience of a spiritual experience listening to music. It doesn’t have to be India; wherever you hear it. Or even people hearing the great German classical music or Chopin can have a pretty ecstatic experience through the works of human beings. The pieces that I’ve come up with that have a strong mood or that kind of a component, I couldn’t explain to you what I was going for when I was trying to write them. I might have found a sound that expressed a feeling or a mood that I tried to write a piece around. I couldn’t explain what that mood is, even, but someone who listened to it would know exactly what I was talking about. Ms. Tippett: We are drawing to a close, and we’re going to hear a little bit more music from you. I often will circle around to this question of what you’ve learned through the life you’ve lived about what it means to be human, and how perhaps that has evolved since your early days — things that you know now or believe now or experience now that would have surprised you then. Ms. Washburn: I was in China after the big earthquake in 2008. I hope I’m right about that. The years are flying by now that I have a baby. Ms. Tippett: They will continue to fly by. Ms. Washburn: And it was very cute and fun. But this one girl came up to me, and she said, [speaks Chinese], which means “Big Sister Wong” — Washburn is Wong. [speaks Chinese] — “Big Sister Wong, I want to sing you a song that my mother taught me.” And my mother died in the earthquake. So she sat down in my lap, and she started singing to me. Tears started coming down my face, and she started to cry too. I had this moment where I just saw this light shining from her and from me. I felt so very connected to her and to everyone. And I just knew that I wanted to live, and I do want to live in that light as much as possible, with her and with you and with everyone. And that’s how I try to live my life. Mr. Fleck: That is so lame. Ms. Washburn: He’s so sweet. Mr. Fleck: I didn’t bring any tissues up here. Mr. Fleck: Aw. What was the question, again? Ms. Tippett: What does the banjo teach you about life? Mr. Fleck: [laughs] That’s a better way to do it. Well, I don’t know. It’s where I put my energy. I feel like everybody — you’ve got a certain amount of energy in your life to devote to various things, and I’ve been putting most of my energy into the banjo for most of my life. What’s interesting — I’m learning as much about life right now from having a child with Abby. Juno is a great teacher. Ms. Tippett: Yeah, that’s been your calling. Mr. Fleck: It’s just like a great physicist has to believe that’s the most important thing in the world, to do the kind of work he wants to do. But once you have a kid, all of a sudden, it’s clearly not the most important thing in the world. So there’s a lot of growing up that comes with that. The challenges now are how to keep the commitment that I made to this guy, while keeping the commitment that I made to this girl and the little guy who’s at home. Ms. Tippett: The holy banjo emperor. Ms. Tippett: Well, it’s great. Ms. Tippett: It’s been a real joy and an honor to dive deeply into what you do and who you are. I’m glad you’re in the world. Thank you for making yourself available for this. And thank you, all of you, for coming. Now they’re going to play some music for us again. Ms. Washburn: All right. This is an old song that was recorded on a porch in Murrells Inlet, South Carolina in the 1930s. 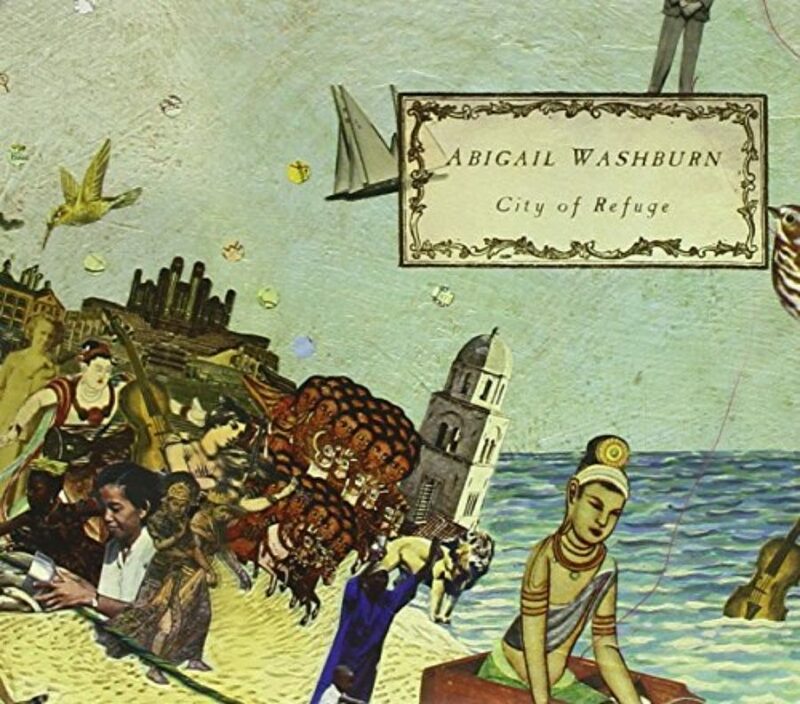 Ms. Tippett: Abigail Washburn’s albums include Song of the Traveling Daughter and City of Refuge. 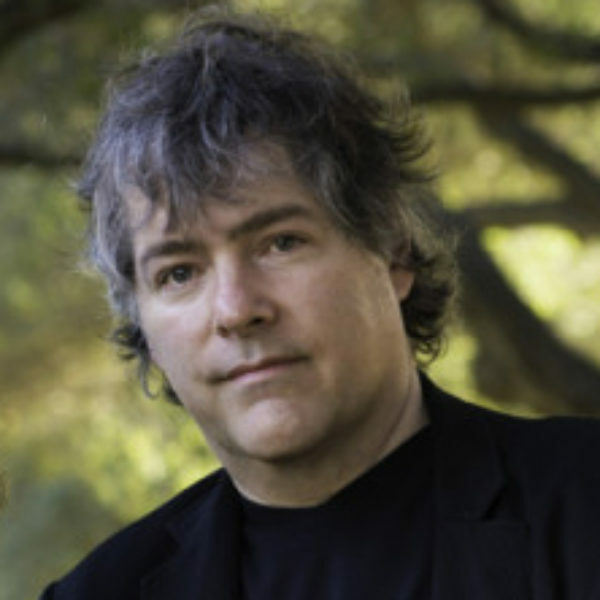 Béla Fleck has recorded over 40 albums, most famously with The Flecktones and New Grass Revival. 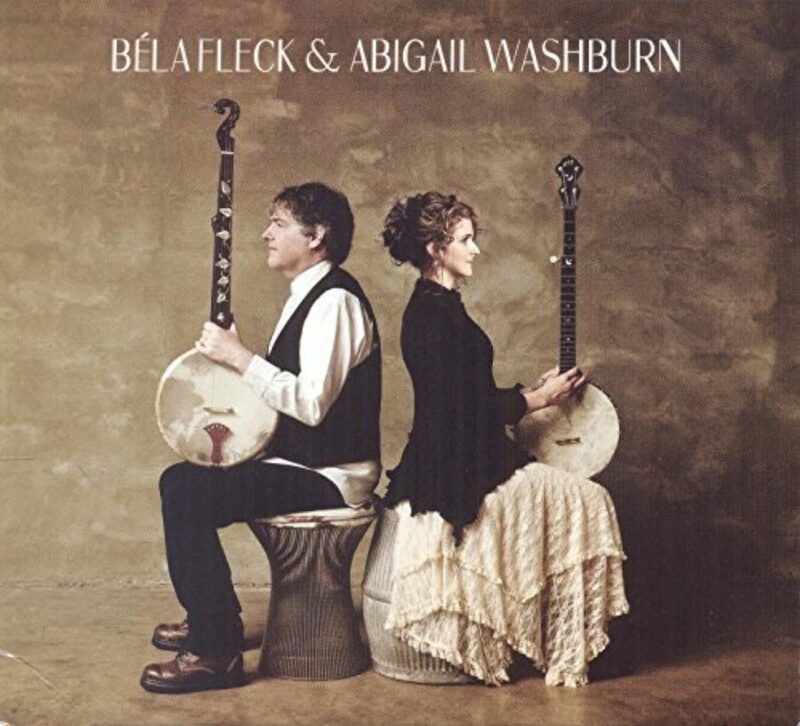 Their first full album collaboration, called Béla Fleck & Abigail Washburn, was awarded the 2016 Grammy for Best Folk Album. Their newest album is Echo in the Valley. And in 2018, they produced another collaboration, their second son. Ms. Tippett: Thanks again to our friends at WPLN Nashville Public Radio who made this show possible. "Come All You Coal Miners"
The act of extending a hand, of seeking, can sometimes leave you humbled by an amazing experience. Watch Abigail Washburn and her band The Village find unexpected rewards at a dinner party with local musicians in China.